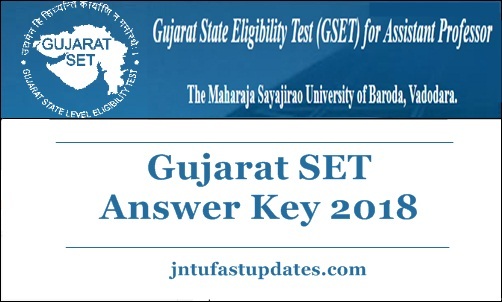 GSET Answer Key 2018: The Maharaja Sayajiroa University of Baroda, Vadodara conducted the 13th Gujarat State Eligibility Test has been successfully conducted on 30th September 2018. Aspirants desirous to become Assistant Professor/ Lecturer in Gujarat have applied for Gujarat SET examination. This year the Gujarat SET examination conducted in many examination centers across the state. More than 80K competitors clashed for the Gujarat SET examination this year. The competition is rising year by year for the State Eligibility Test in Gujarat. All the competitors who have attempted the Gujarat SET on 30th September can download Gujarat SET Answer Key/Question paper solutions from the official portal, gujaratset.ac.in. Aspirants can download the GSET Answer key PDF for all sets A, B, C, D. After downloading the answer key, compare the answers with the corresponding set to estimate the probable score. By analyzing the score, aspirants can know about their score, level of competition, about the qualifying marks and other things related to the GSET. The Maharaja Sayajirao University of Baroda is the well-established University of Vadodara. The University is recognized by UGC, New Delhi for organizing the SET examination in the state of Gujarat. The University was established in the year of 1949. The University offers various courses such as technical, science etc. The MSU conducts State Eligibility Test for aspirants seeking to become Lecturer/Assistant Professor in various Government/Private colleges in Gujarat state. The Gujarat State Eligibility Test has been conducted for 23 subjects. The examination has organized in 6 examination centers in the state of Gujarat. All the hopefuls competed for the test on 30th September can check the details of answer key and can download the answer key from the following. The Answer key(s) for all question papers will be uploaded on the GSET website www.gujaratset.ac.in before preparation of the Final Result of GSET Examination. Candidate(s) appeared in GSET Examination can download the Answer key(s). In case, the candidates, who are not satisfied with the answer key(s), may challenge the answer key(s) by sending a written request to the Member Secretary, Gujarat State Eligibility Test, The Maharaja Sayajirao University of Baroda, B – Block, Chameli Baug, Nr. University Guest House, Prof. C. C. Mehta Road, Vadodara – 390 002 supporting his / her stand with standard books / literature along with the Demand Draft of Rs. 1,000/- per question in favour of the ” Member Secretary, GSET” payable at Vadodara, within stipulated time period given for the same. The envelope should be marked “Grievance Regarding Answer Key(s) of GSET Examination”. The request(s) so received will be placed before the Subject Expert Committee(s). In case the challenge of any candidate regarding answer key(s) is accepted, the fee will be refunded to such candidate. In all other cases the fee once paid will not be refunded. GSET Agency’s decision on the challenges shall be final and the result will be declared on the basis of final answer keys. Candidates who are eager to check the answer sheet immediately can check the unofficial answer key from various sources. The Gujarat SET unofficial answer sheet will be accessible on various coaching institutes’ websites. All the Gujarat SET coaching centres offer the answer keys. So, as aspirants can tally their answers with the unofficial answers to estimate the score. Career launcher, and other coaching centres are going to provide the answer sheet soon after examination. Candidates can download the answer keys from these websites until the official answer key is released. While it is important to download the official answer sheet ultimately to check the perfect answers. Stay visiting the official website, gujaratset.ac.in to download the official answer key. Gujarat SET official answer key will be accessible in 1st week of October (tentatively). Aspirants competed for GSET can keep checking the GSET website to download the answer sheet/question paper solutions. Candidate who has registered for the Gujarat Set exam on 30th September, 2018 will be able to download the arrow key. How to Download Gujarat SET Solved Question Papers or Answer Sheet 2018? Once you find the link, click it and in the new window appeared give your details necessary in the fields and click on the print answer key option. Finally your Gujarat SET Answer Key 2018 will appear. You can take a Print Out of the Answer key in the PDF and verify your answers with this GSET 2018 official answer sheet. 1.2 How to Download Gujarat SET Solved Question Papers or Answer Sheet 2018?